^ Drane, John (1999). Revelation: The Apocalypse of St. John. Palgrave Macmillan. p. 53. ISBN 978-0-312-22513-1. 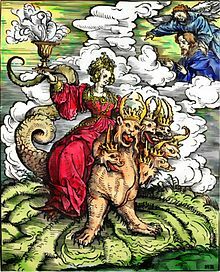 ^ "And the woman was arrayed in purple and scarlet colour, and decked with gold and precious stones and pearls, having a golden cup in her hand full of abominations and filthiness of her fornication: And upon her forehead was a name written, MYSTERY, BABYLON THE GREAT, THE MOTHER OF HARLOTS AND ABOMINATIONS OF THE EARTH."